This is for the Way To Use It Challenge over at Splitcoaststampers - The Challenge was to make a card that was music inspired. I had the Punny Farm Stamp Set out (My Favorite Things) -because I was getting my cards together for a "My Favorite Things" Swap and the Be Happy Stamp Set from Close To My Heart - perfect for the challenge. Wasn't the horse Trigger? I can't remember (stuff???) the proper name for "stuffed", but I know a taxidermist does it!!! 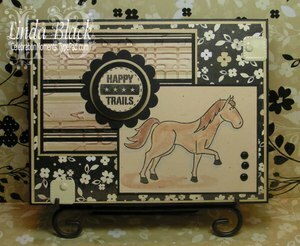 This would be a great card for one of my "horsey "friends, and I love the color combination. Since someone already mentioned Trigger as Roy Rogers horse, I thought I'd throw this question out to you. What was the name of Dale Evans horse and what was the name of their German Shepherd? Give up? Buttermilk and Bullit. Guess you can tell how old I am.